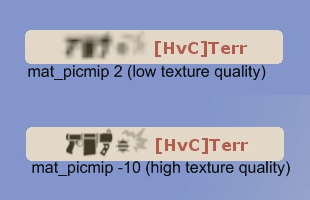 After the recent update, some folks have complained about things like blurry weapon icons. 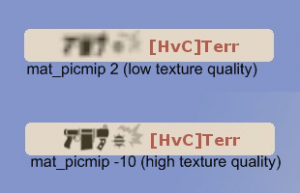 Apparently the new version of the icon file didn't have settings to prevent low-texture-quality settings from working with the icons the same way they do with all the other textures in the game, so everyone used to low-quality blurry floors and walls now had bits of their GUI also going blurry. An example of the glitch. Hopefully Valve will make an update soon to fix this, but in the meantime you can solve the problem by extracting the problem files and modifying them with VTFEdit, using the modified copies to override the ones that are in the game's core files. Rather than make everyone do it themselves, I've uploaded "fixed versions" right here. This will only work on servers which aren't set to sv_pure, and after Valve patches it you'll want to delete the copies you've made: If you leave them sitting around your hard drive you won't see any new icons Valve adds to the game later. Simply follow the instructions in the readme.txt file.